Thank you to our friends at Empire Wine! Thanks to Empire Wine! A Great local business (picked No. 1 in the wine store category for Times Union’s Best of the Capital Region 2015) with a heart that loves to help and give back, just like ASAP – Albany Society for the Advancement of Philanthropy! 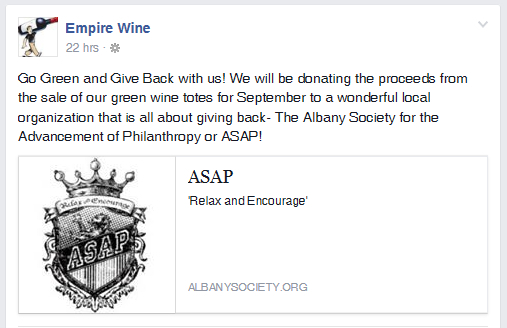 Stop in today (and everyday in September) and purchase your green wine tote! This entry was posted on Wednesday, September 2nd, 2015 at 10:51 am	and posted in Uncategorized. You can follow any responses to this entry through the RSS 2.0 feed.